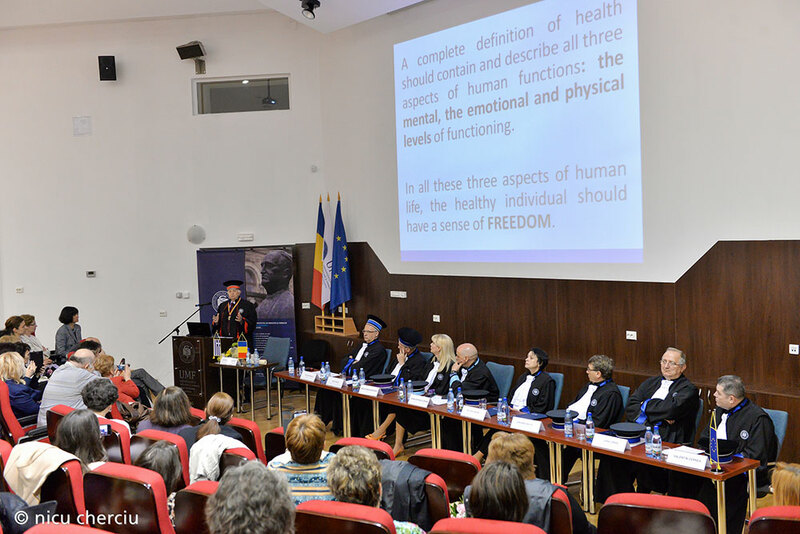 Today I feel proud and happy, not only for myself, but also for this Medical School of high standards that honors me and in my name is honoring a healing methodology that I strongly believe will prove to be in the future an excellent therapeutic modality. This Homeopathic therapeutic methodology, established 200 years ago, by the German physician Samuel Hahnemann, is starting now to be accepted in several open, pioneering medical institutions of high knowledge and standing. I must say that if there is one who deserves this distinction today, it is not me but this genius German doctor who was almost totally unknown the year I first came in contact with homeopathy which was 55 years ago. It was then that I discovered, according to my understanding, the most profound healing methodology. My contribution, in re-interpreting this therapeutic modality, is a small token to this great man, who was persecuted from the very beginning when he announced his research findings in 1810. I will try now to give you in a short exposition from my clinical experience of 55 years. During these years I never stopped studying, observing and analyzing hundreds of thousands of chronic cases. I want to make clear that these are only my observations and conclusions arising from many thousands of cases I was treating. They cannot replace the security of vigorous scientific scrutiny that may confirm them. I must apologise if my observations will sound unreasonable or presumptuous and my way of expressing them boisterous, my intention all these years was to put my observations and findings to the test by the scientific community. Some of my observations have been confirmed already, some are waiting for acceptance or rejection, but I am giving them for whatever they are worth. For me, homeopathy constitutes a system of therapy that may complement the existing medical armamentarium. In 1978 I wrote my first book the “Science of Homeopathy” which soon became a standard textbook for all students in Homeopathy. One of my first concerns was to define the target of all healing methods: what is HEALTH and how could it be improved. By then the existing definitions of health did not satisfy me. Therefore I tried to construct a more comprehensive definition of health with the least possible words. After several years of observing sick individuals and their road to recovery, I thought that a complete definition of health should contain and describe all three aspects of human functions: the mental, the emotional and physical levels of functioning. In all these three aspects of human life, the healthy individual should have a sense of FREEDOM. So I coined the new definition for health in which the idea of FREEDOM became the central theme. So for me an ideal health should have freedom from pain on physical level, freedom from passions on emotional levels and freedom from selfishness on mental level. Details of this definition can be found in my book the “Science of Homeopathy”. I gave this definition because I felt that a real therapeutic modality should drive the patient towards this ideal state of health. I also thought a lot about the “measure of health”. The question was how one could declare whether a person under treatment was improving really in his health in contradiction to having simply his symptoms reduced or eliminated. What were the parameters that would make a physician feel that they had helped their patient to have a better overall state of health. I will not go into details now about these issues. I have been teaching my students that they should comprehend these basic ideas if they were to practice medicine in a meaningful way. These issues may sound trivial but if a physician has a correct concept of what it is to feel really healthy on all three levels, he may be able to ascertain whether a patient whom he treats is actually improving in his overall health or on the contrary is degenerating. What I was proposing to my students all these years was not a theoretical model on medical philosophy but actually tangible facts about health and disease that could help them in their daily practice. These initial thoughts of who is sick, how deep is their sickness, who could they be cured, who had passed the point of recovery etc. led me eventually to the idea that there were different levels of health in which each one of us belongs at any given moment. This level can change due to inner or outer stimulations or stresses. I stated some rules and parameters to define these levels, a task that in order to be complete needs a lot of good research. This subject was further expounded in my next book “A New Model for Health and Disease” which was published in 1985, in which I gave some rules defining these levels. A further more detailed aspect of the theoretical basis of what I was saying was stipulated in my book “Levels of Health”. What I had found out in my observations was that while two persons may have similar symptoms and similar pathology, the one was easy to cure, the other much more difficult. This was happening not accidentally but according to some inner rules or conditions of the human organism that were not so far revealed. This is another area that needs further rigorous research and explanations. These observations led me further to investigate the reasons underlying such differences in reactions and I discovered some very interesting facts. I discovered that a lot of chronic conditions had started after strong sudden shocks on the organism, like injections of strong chemical drugs, severe traumas, vaccinations, surgical interventions, huge emotional griefs, strong mental worries, exposure to sudden atmospheric changes etc. that acted suppressively upon the immune system, thus modifying it. Actually I had found evidence with many chronic diseases that their beginning process started after an acute inflammatory disease with high fever, which was stopped abruptly by being treated badly or suppressively with excess of chemical drugs. Symptoms started and continued for years after such interventions, ending up finally in a diagnosis of a specific chronic disease. Perhaps it is not common knowledge that an acute epidemic should be actually left to run its course and helped only by mild means or remedies, because if it is stopped abruptly by violent means - like strong, unnecessary drugs - then a suppression may take place and then we may witness what is well known as side effects of the medications. These side effects may pass away with time in some cases but in others they may trigger the starting of a chronic disease for which the person has a genetic predisposition. A common bronchitis could turn in to bronchial asthma, a common cold into a chronic sinusitis, a suppressed tonsillitis may trigger cluster headaches that last for life etc. But what surprised me was to see that, if the organism from a period of acutes with high fevers was shifting to a chronic condition state, then the organism will not manifest acutes any more ! This was a revelation for me, as I could now understand why an organism that had initially a series of acute diseases up to a certain age, would suddenly, under certain stress, stop developing acutes with high fever and start a process of a degenerative chronic disease. This phenomenon was never mentioned in conventional medicine as far as I know, yet if this was really a fact, it was of such importance that could change the whole concept in medicine and also our perception of health and disease. The chronic diseases have periods of exacerbations and recessions as we all know, attributed to unknown factors. What I suspected was that the exacerbations were due to the rise of a sub-acute inflammatory process that was taking place periodically. Were these exacerbations in chronic diseases something accidental and meaningless or were they periodic unsuccessful efforts of the immune system to cure itself from a degenerative disease that had started after the suppression of the acute inflammatory processes? This was a crucial question for me and my observations, the following years, gave me some answers that I have put in front of the scientific community through my books, the teachings and the articles. But the main question was: how could we know that a suppression had taken place after all ? What I will say now may sound unbelievable but it has been confirmed again and again in thousands of cured cases: if a patient was treated with homeopathy successfully for a chronic condition, during the time that they were getting better, the chronic symptomatology will gradually disappear while at the same time acutes with high fever will emerge again. The re-appearance of the original acutes after 5, 10 or even 20 years in some cases, during which time they had no acutes, signals the return of the immune system to its old balanced state. Was it possible that the ability of the organism to raise again an inflammatory process with high fever was a good sign showing that the patient is moving towards a complete recovery from his chronic ailments ? Experience has shown that this was true, the re-appearance of the acutes signaled the end of the chronic suffering. The exacerbations of the chronic conditions are well known to medicine, what was not known was that the organism, once it had entered in a chronic state, would not raise anymore a high fever. The organism while in a chronic state would not react even if it was coming in contact with bacteria or microbes or viruses that they used to bring about violent reactions in the past. This phenomenon was never explained by conventional medicine. The strange thing for me was that nobody had ever looked and investigated this phenomenon in spite of billions of dollars spent in medical research. These observations made me understand the real meaning of high fevers. Those organisms that were able to raise easily a high fever during an acute epidemic (like most of the children and babies in older times when they passed almost all epidemic diseases) were belonging to persons that were having a considerable good health, they were healthy and alive especially on emotional level, were happy and joyful and were free from a deep chronic disease. These observations of many years of treating thousands of cases with chronic diseases, and the consequent development of old acutes at the end of the treatment, led me to the understanding that there was a “continuum” in the medical history of a patient. I will not go in to details at this moment but suffice to say that there is a “continuum” in the development of diseases, acute and chronic, and a reciprocal influence that I have expanded in an article with the title “The continuum of a unified theory of diseases”. A full text of this exposition can be found in the Medical Science Monitor Journal. All these observations may sound as a new aspect in medical theory, but I only put these observations in front of the medical research groups to be re-examined. For me it was an amazing thing to observe that after the starting of the chronic degenerative disease, the immune system could not raise any more a high fever, as if there was a “defect” in the immune system. This phenomenon was not given the proper attention so far by researchers, on the contrary there is the impression that this “defect” of the immune system was protecting the individual from being infected with epidemics or other acute diseases. I realized then that the effort of the immune system to deal with an acute, if cut short and not allowing the organism to deal with it, was now replaced by regular exacerbations of chronic conditions. This is how I could explain the periodic exacerbations in chronic diseases, as ineffective efforts of the organism to cure itself. How do we know that this is a fact? It is because when we give the similar remedy, after an initial aggravation of the symptoms, there ensures a cure without side effects. This is the essence of Homeopathy. The main problem is to find the most similar remedy that will trigger the immune response. To this goal I have tried to help with the writing of a 12 Volume homeopathic pharmacology, the Materia Medica Viva, that is a modernised psychopathology of the remedies used in homeopathy. All this knowledge is transferred to my students during my live courses in the Academy in which I teach every year for many hours or via our E-Learning Program. In 1995 I founded the “International Academy of Classical Homeopathy” in Alonissos, an island of the Aegean Sea. The courses had started before that in Alonissos since 1979 and had initially been taught in a public building of the island. It is impressive because every year since then, thousands of students - medical doctors and professional homeopaths - travel from very distant countries to Alonissos on a long journey to acquire the homeopathic knowledge. To this day, approximately 15,000 doctors and practitioners from 62 countries around the world have been trained at the Academy. The course’s schedule, due to weather conditions, runs from May to September. One of the most important details is that a remarkable number of these students keep coming back every year for the last 15-20 years. They are the best prescribers in their respective countries. For those who for any reason haven't managed to experience the teachings in Alonissos, we have created the E-learning Program, a full academic program, based on the highest educational standards, that has already been adopted by several Universities. So far the E-Learning Program has been all over the world and has been attended by students in 73 counties. Last but not least, I want to make clear that homeopathy does not cure everything. There are pathological conditions that have passed the point of cure as far as homeopathy is concerned. In such advanced pathology, the need for conventional medicine is imperative. I want to stress here the idea that homeopathy is useful, primarily for patients before the deep structural changes have taken place. It is a predecessor of pathological changes, it is a medicine that is needed during the prodromal period of chronic diseases, when conventional medicine has no answers, it is therefore a complementary therapy that medicine needs urgently at this moment. In spite of all the evidence of 200 years, some of the critics of homeopathy still maintain that this is an old-fashioned modality, an ancient therapeutic system, that is useless today in the face of modern medicine, therefore we do not need it. They do not realise that this very argument is exactly the proof that this therapeutic system, being practiced with impressive results for 200 years, is the proof of its validity and to my understanding it is a real pioneer in therapeutics. I believe that the medical institutions, that will open their doors to this complementary medical modality, will be the pioneers in a turning point in global medicine that is emerging fast, a new paradigm in medicine, that hopefully will deliver the expected health benefits the world is hoping for. I do wish and hope that this excellent Medical University in which I have the honor of talking today will be one of the best pioneers in a new paradigm in Medicine and that it will become a pillar of resistance to this catastrophic storm of chronic diseases that is approaching fast in our societies. In conclusion I want to say that the ideas I spoke about can be considered as assumptions and as such I put them forward for consideration and research and in this excellent Medical University we could devise interesting experiments to investigate these ideas together. Thank you for listening to this rather strange, rare and peculiar view of therapeutics, but I can assure you it is coming from my experience and true observations in this life of 55 years of practice that were full of challenges, struggles, fights and conflicts but did not stop me from promulgating what I always felt was a boon to humanity given by this genius German physician, Christian Samuel Hahnemann. Thank you for being here with me on this special Day!